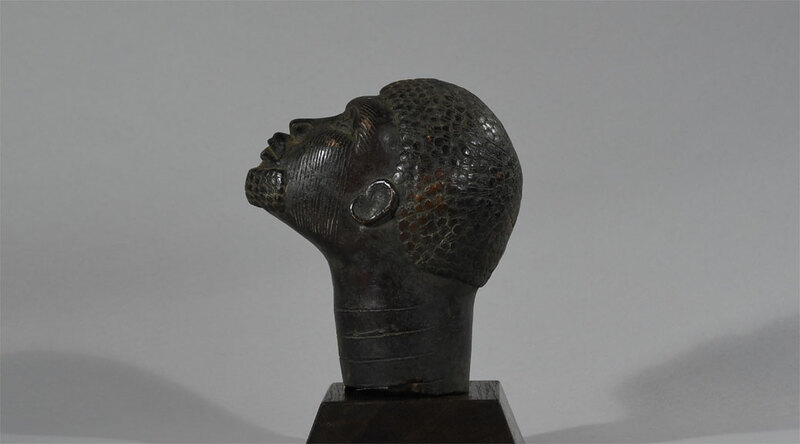 This proportional small but powerful Benin bronze head with an advanced and bearded chin visualizes a prince of the ancient Ife kingdom which was founded in the early 14th century AD. Ife is the ancient Yoruba city located in South-Western Nigeria wich was founded in the early 14th century. The city is located in the present day Osun State about 200 kilometers northeast of Lagos. Ife is the ancient Yoruba city located in South-Western Nigeria wich was founded in the early 14th century. The city is located in the present day Osun State about 200 kilometers northeast of Lagos. 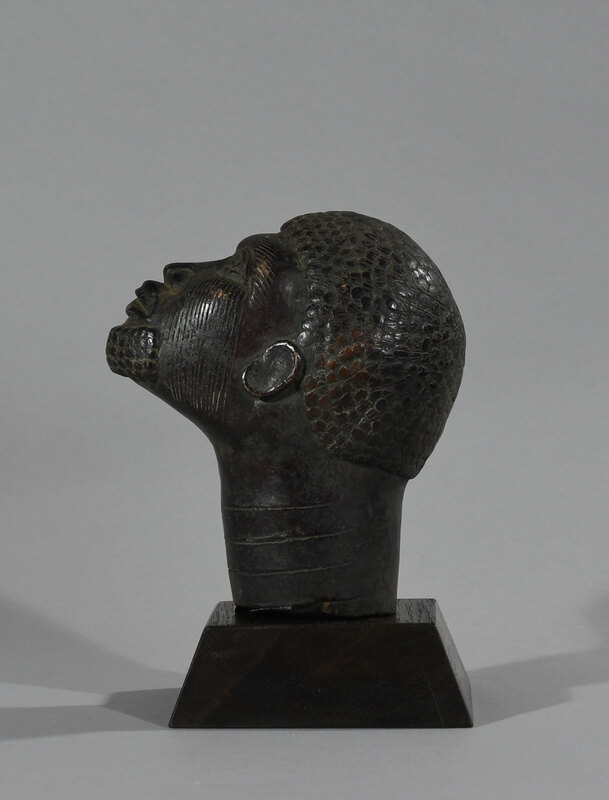 The majority of everyday Benin objects were made for and associated with court ceremonies. 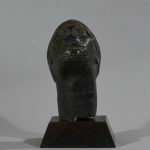 The art of bronze casting was introduced around the year 1280. The kingdom reached its maximum size and artistic splendor in the 15th and 16th century. 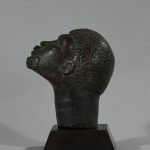 For a long time the Benin bronze sculptures were the only historical evidence dating back several centuries into the West African past, and both the level of technical accomplishment attained in bronze casting, as well as the monumental vigor of the figures represented, were the object of great admiration. 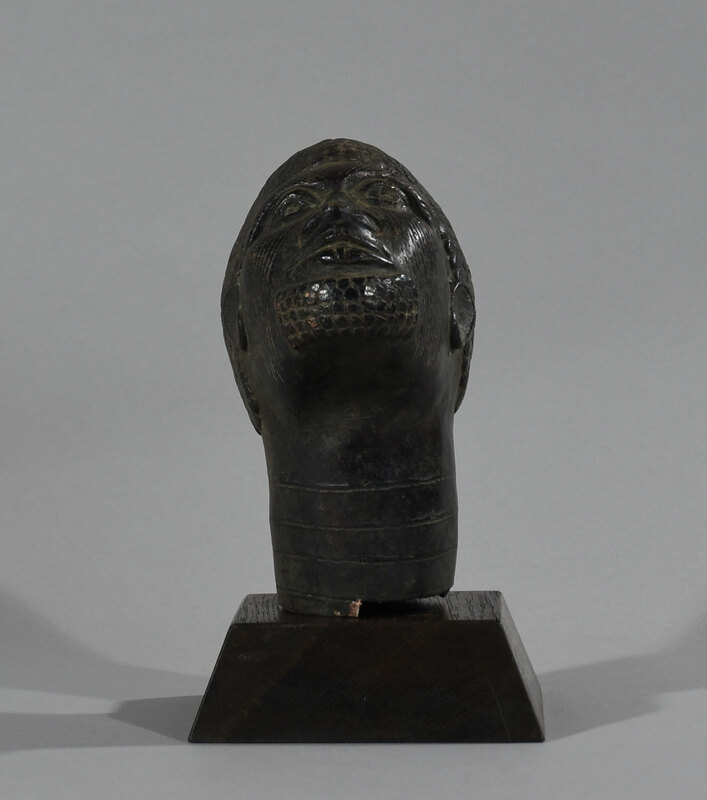 Benin bronzes are better known than the artworks from Ife or Owo due to their presence in Western museums since 1890s. In the 13th century, the city of Benin was an agglomeration of farms enclosed by walls and a ditch. Each clan was subject to the oba (king). The Benin style is a court art from the palace of the oba, and has nothing in common with tribal art. The Benin oba employed a guild of artisans who all lived in the same district of the city. Bronze figures ordered by the king were kept in the palace. In the 19th century, disputes over trade led to strain between Benin and its chief trading partner, Great Britain. This escalated as the European powers moved to divide Africa into colonial territories. The situation culminated in 1897, when a large delegation led by Britain’s Acting Consul-General in the region, James Phillips, set off for Benin City despite requests from Oba Ovonramwen (enthroned c. 1888) to postpone their visit. The Benin empire flourished until 1897, when the palace was sacked by the English in reprisal for an ambush that had cost the British vice-consul his life. Objects within the royal palaces were now the spoils of war, many of which were sold to defray the costs of the invasion. Others were shared among members of the expeditionary force. Still others left Benin in the confusion that followed the devastation of the kingdom. 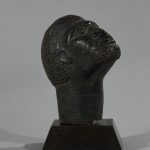 When Leo Frobenius (German Africa-ethnologist) discovered the first example of a similar head it undermined existing Western understanding of African civilization. 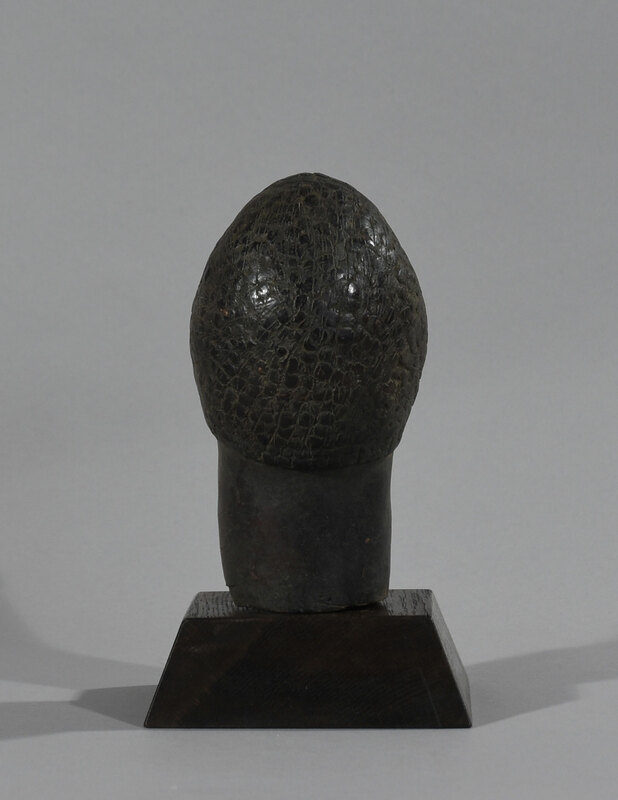 Experts could not believe that Africa had ever had a civilization capable of creating artefacts of this quality. Attempting to explain what was thought an anomaly, Frobenius offered his theory that these had been cast by a colony of ancient Greeks established in the thirteenth century BC. He made a claim, widely circulated in the popular press, that his hypothesized ancient Greek colony could be the origin of the ancient legend of the lost civilization of Atlantis. 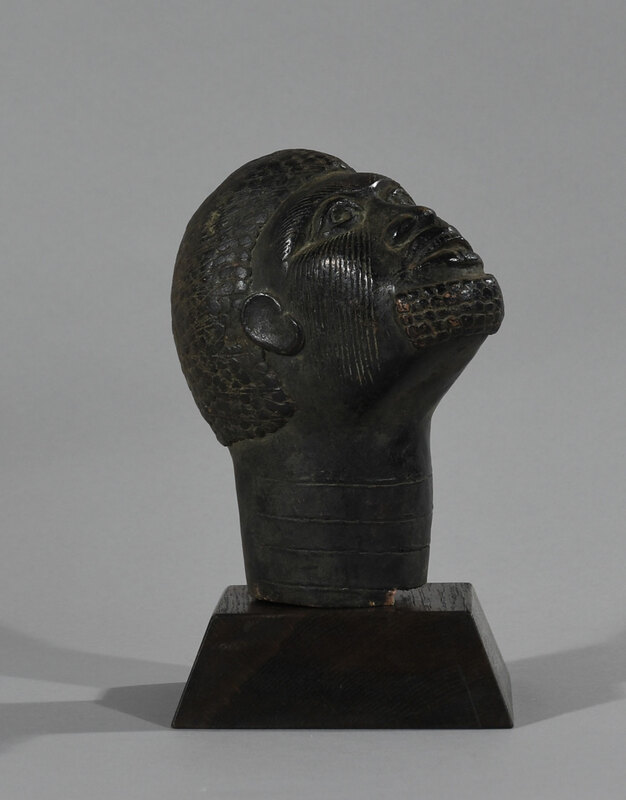 Upon their arrival in London, Benin’s royal arts were a topic of conversation and speculation. They sparked immediate interest from museums, particularly in Britain and the German-speaking world, which made efforts to purchase the objects for their collections. 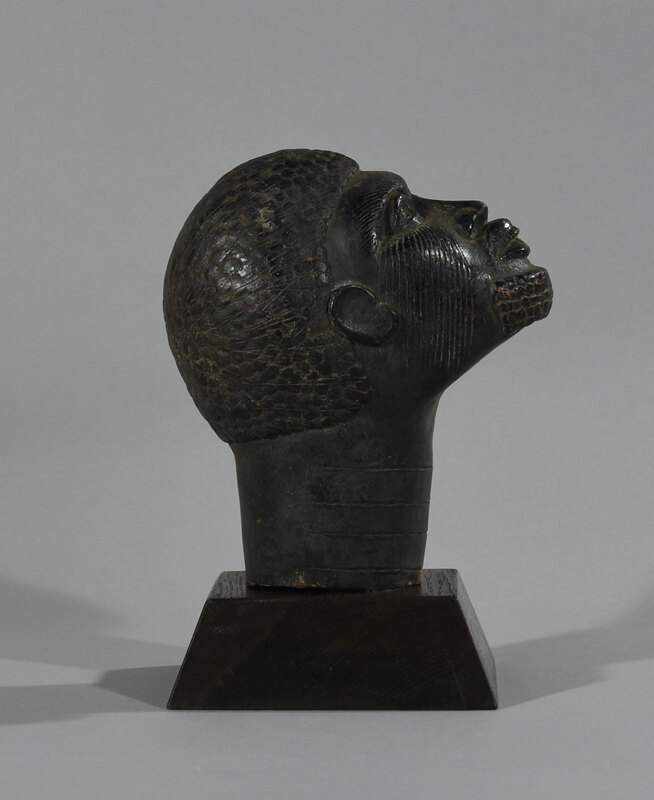 Eventually works from Benin could be found in museums across Europe and the United States. Provenance: From the heirs of a private collector in Belgium. 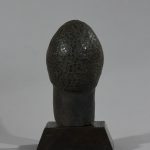 Where the collector got the head from is unknown. 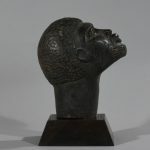 Condition: The head is in good condition and appears in a dark patinated bronze. Dimensions: H: 20, W: 10, D: 18 cm – weight 1,75 kg. Suzanne Preston Blier, Art and Risk in Ancient Yoruba: Ife History, Politics, and Identity c.1300, Cambridge University Press, 2015.